Baseball Opening Day, March 23rd Vincent Beck Stadium. Lamar University at 12:00pm. Sign up your child today, 100% free of cost! 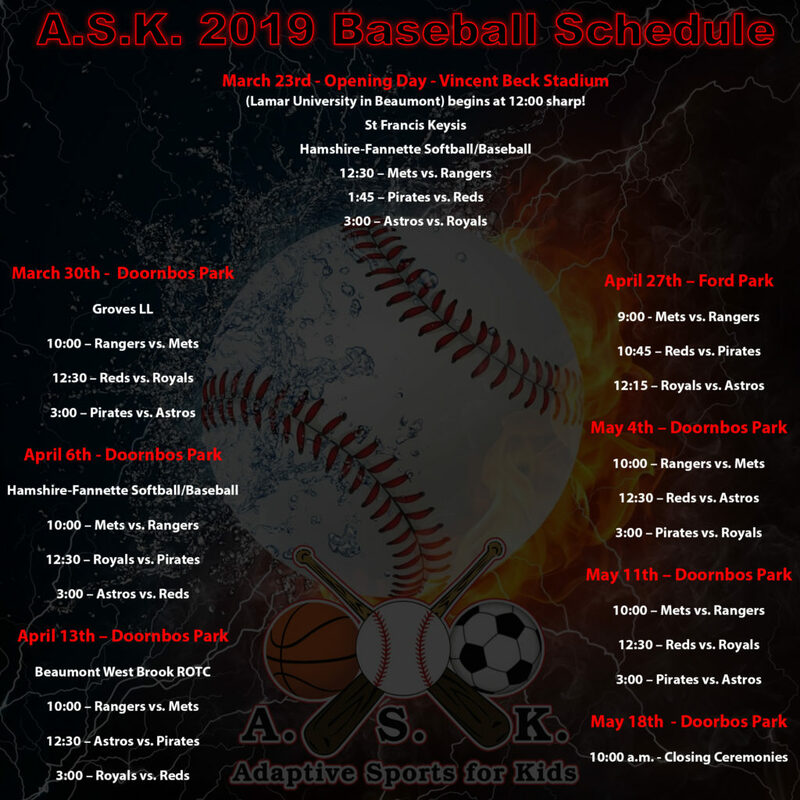 Adaptive Sports for Kids (A.S.K.) is a non-profit, 501-(c)(3) organization which provides year round sporting opportunities for children and young adults with physical and/or mental disabilities. Currently we provide Baseball, Tae Kwon Do, Cheer, Soccer, Flag Football, and Basketball. All sports are held at Doornbos Park in Nederland, Texas, and there is no fee to participate. We encourage everyone to come out and watch a game, we promise it will change your life! Notifications of game times and dates, as well as cancellations, sent directly to your cell phone via text message. Simply Text @ADAPTIVES to 469-645-0101. You will receive a text message asking for your name. Simply reply with your “name” (i.e., Kerri May) and you will start receiving notifications. It is our desire to have our own Handicap Accessible Sports Arena, complete with a Baseball Field, indoor gym and concession stand, to be built at Doornbos Park. Our dream is not too far away. Please contact us to see how YOU can help! All donations will help Adaptive Sports for Kids buy specialized equipment needed in order to assist our children. This includes sporting equipment, beep balls, beep bases, wheelchair accessible soccer balls, uniforms, trophies and/or medals, etc. We greatly appreciate your support! All games will be played at Doornbos Park, unless otherwise noted! Please check the schedule closely, some games will be played at Vincent Beck Stadium or Ford Park! Rain-out decisions are usually made last minute. Text Message Alerts via Remind 101 are the BEST way to keep up with game times and cancellations…please sign up (directions above). You may also check our Facebook page daily for rain-out information; however, you may have to go directly to our page to make sure you see all of our posts!